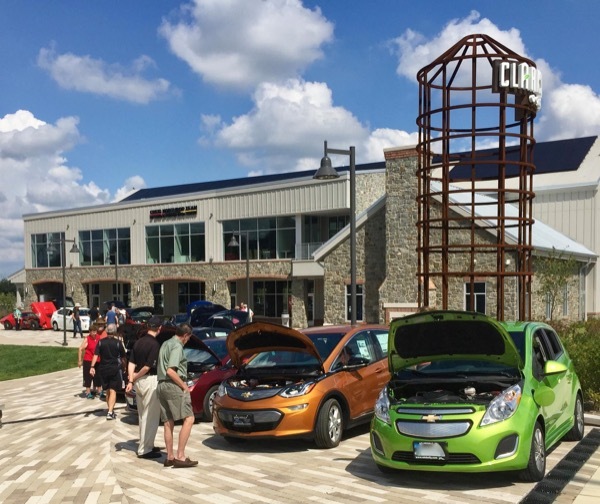 Clarksville Commons is a mixed-use development with strong commitment to sustainability and community - the perfect location to host an EV celebration. We put one of each kind of car on the plaza, and all other in one aisle of the parking lot for 'tailgating.' Three local dealerships brought cars, plus seven community members agreed to also park on the plaza and act as representatives for the make/model they own. The dealerships displayed Spark, Volt, Bolt, Leaf, and Fusion Plug-in. Community members brought Prius Plug-in, Tesla S, Tesla X, Mercedes-Benz B-Class, BMW i3 REx, Fiskar Karma, Think City, and a snazzy red sports car that someone made from a kit. We started organizing the event with just three weeks notice and were extremely pleased and delighted with our turn out! Join us for a National Drive Electric Week Showcase & Tailgate Celebration at Clarksville Commons on Saturday, September 16th from 12-4pm. Part electric vehicle showcase, part tailgate gathering, we will be showcasing various EVs from area dealerships with knowledgeable staff to answer your questions. All EV owners in the community also invited to show up with their cars to brag, compare notes, and generally geek out. Local organizations and companies with an electric vehicle or environmental focus will also be present. Click the blue register button at the top of this page for a chance to be entered to win a $250 gift card. Registered attendees report 398,059 electric miles driven.